If you follow TMSM, then you know our story. If you’re new to our Disney Ohana, let me give you a little refresher course. Last Spring, my family and I made the decision to move from our lifelong home in Michigan to the Orlando area in hopes to better our business. This decision didn’t come lightly, or without a lot of prayers, tears and worry. I’m a home type of person. I’m very close with my family…. parents, grandma, aunts, uncles, cousins, etc. We’re that type of family, we see each other a lot, and I knew breaking away from that would be hard. I don’t like change, I fight it at all costs, but I also knew that this type of change could be good for us. So, I decided, with the blessing of my family, to face my fears and make the move to Florida. It’s been just over a year, and while I miss my home and family in Michigan, so far it’s been a good transition. I’ve been lucky. Because of my job, I can travel back home more frequently, and my parents are retired, so they’ve been to Florida to visit us too. Speaking of visits, we just got back from a long stay in Michigan, and on the drive down, I noticed a huge change in perspective. My vacations are reversed now, and it feels a bit odd. It’s an 18 hour drive, give or take, between our home town in Michigan and the land of Mickey Mouse and palm trees. I remember when we lived in Michigan, the long drive to Disney was welcomed and exciting. I couldn’t wait to see the various welcome signs as we hit the different state lines. We’d see the “Welcome to Florida” sign on the side of the road, and we’d all cheer, as we knew it wouldn’t be long until we started to see billboards for Walt Disney World. We were almost at our Happy Place. Now, on the flip side, it’s a different dynamic. As we were driving north a few weeks ago, I found myself looking at the road signs and getting more excited, the closer we got to Michigan. I made a conscious effort while driving, to look around and take it all in. It was the same thing I used to do when driving down to Florida. It’s all backwards now, and it’s strange to me. Georgia takes forever to drive though, and Ohio just feels like forever, so by the time we saw the “Welcome to Michigan” sign, my boys were cheering. Again, reversed. We never cheered for Michigan before. It’s so different now. When we finally got to my parents house, and were able to see all of the family members on the 4th of July, I was so happy. My heart was full. Similar to how I felt when we’d finally hit Disney property. Again, I was trying to breathe in and savor the moments with my family, because I knew that we’d be leaving them again before I knew it. I used to do that on Main Street at the Magic Kingdom, stop to take it all in and just be in the moment. Yep, another reversal. Isn’t that strange? Oh, but it gets even more strange. Going to Florida meant buying Disney shirts and trinkets to remember our trip. I always had to bring extra bags for my huge amount of Disney souvenirs that I knew I would be accumulating. Disney shopping is an addiction! Well…. low and behold, now when we go to Michigan, we’re looking to buy Detroit Lions shirts, or Detroit Tigers souvenirs. What in the world is going on here? When I lived in Michigan, I never felt the need to buy Detroit sports apparel, but now when we go there to visit, we come home with a bag of Detroit swag. Crazy. How about sight seeing? Having a camera ready while on Disney property is a must. Disney fans take pictures of EVERYTHING. We take pics of food, signs, rides, merchandise, and the list goes on and on. Anything Disney is picture worthy. Now lets flip it. When we go to Michigan, I find myself taking pictures of food, signs, landmarks in Detroit, just about anything that I can find that remind me of home. Again, I never took pics of Detroit before unless we went to a ballgame. I didn’t take pics of lunch and dinner at our favorite restaurants. Now I do! We don’t have good Chinese food or pizza in Florida. We don’t have Coney Island restaurants in Florida either, so when we go home, taking pics of Sweet and Sour Chicken or a Chicken Gyro and chili cheese fries doesn’t seem like an odd thing to do. It’s the same concept of a Disney tourist take a pic of their meal at Chef Mickey’s or snapping a shot of a Disney cupcake or pretzel. It’s just….. reversed. So, what’s going on here? How did we go from Disney tourist to Disney local in our way of thinking? Does it mean that Disney is less special now? I’d say no…. it’s just different. Sure, we still get excited when we go to a Disney Park. I still like to see the Disney billboards and such on the side of the road. Florida is still a beautiful and magical place to us, but moving here gave me a new appreciation for our original home in Michigan. We’re “locals” now…. not vacationers. Vacations for us mean heading to places other than Disney, and it’s hard to wrap my head around that sometimes. On our way back from Michigan, we stopped in Daytona Beach. Now that felt like a vacation too. Being by the ocean is beautiful, and not something we get to do often, so that part of Florida is like a vacation to us. Getting closer to Disney is like going “home” now, in multiple ways. Being a Disney local as opposed to a Disney vacationer has been an eye opening experience. It’s like two different lives, and it really does take some adjusting. When I lived in Michigan, I used to call Disney my second home. Now, it really is. Home to me will always be where my family is. The place where I grew up and the experiences I had in Southern Michigan will always be in my heart. However, now the Disney area is home too. I guess my heart is big enough to embrace both. 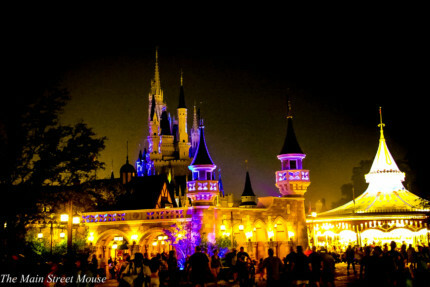 When we went back to Michigan at Christmas time, I missed Disney. When we went back to the Magic Kingdom for the first time after the holidays, I stood behind the Castle, looked, and something inside me said “I’m home.” This past month, when we turned the car down my parents street, pulled up in their driveway and saw my parents, brother and sister in law in the garage waiting for us…. the same feeling was there. That’s home too. Things change, that’s part of life, but sometimes change is for the good. Just because our perspective changes, doesn’t mean we don’t still have the capacity inside to embrace all aspects, past and present. I was happy being a Disney tourist, and I’m happy now being a Disney local… and these days, having two homes is proving to be quite a blessing!